Off Grid 18 Kicks Off in Sydney: What Makes a Great Design? Last night, SEGD’s Sydney Chapter held its first event of 2018 featuring three design studios: THERE and Urbanite from Sydney, and PUBLIC from Vancouver. We were especially lucky to have Susan Mavor join us en route to Off-Grid in Wellington. She kindly changed her flights so she could swing past Sydney, battling jetlag to share a luminous project she designed for University of British Colombia called "Start an evolution." 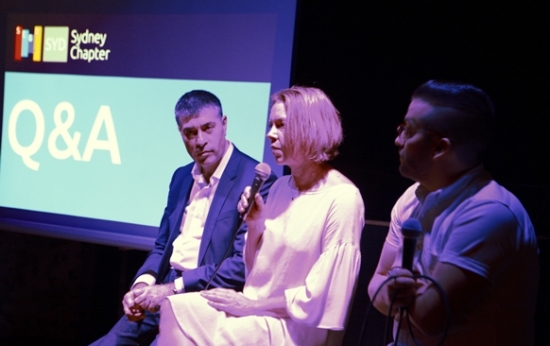 Moderated by BrandCulture’s Nick Bannikoff and called "What makes a great design?" the event was the first to kick off Off-Grid 2018, which runs in Sydney, Melbourne, Brisbane and Wellington from now until February 27. It was a chance for Sydney’s experiential design community to learn more about the processes and craftsmanship that went into creating five award-winning projects at the 2017 SEGD Global Design Awards. First up came Charlie Bromley, Head of Environments THERE in Sydney, who showcased two projects for Knight Frank and Rabobank, both created in collaboration with Geyer. Rabobank is a bank that services rural communities, and its brief was to "Make work feel like home." They were consciously trying to make their workplace feel warm and tactile, and THERE’s graphics and signage needed to play into that narrative. Inspired by land cartography and old maps of Australia, they began designing a library of patterns to represent different types of farming. It’s a project with lots of thoughtful touches like illustrated gumboots and umbrellas resting against doorways, or hidden symbols on patterned lockers like a tiny bumblebee or apple – micro details designed to be discovered by employees and visitors for years to come. Next, we heard from Susan Mavor, Principal Communication Design and founding partner at PUBLIC in Vancouver. She admitted donor recognition projects are not her favorite, but this one for University of British Colombia she’s rather proud of. It’s an outdoor installation with an interactive element encompassing illuminated poles of light that change color as people work through them. Over the course of a year, a whole series of concepts was proposed and rejected until PUBLIC landed on this idea of creating individual pieces that throw out light. The last speaker was Carlo Giannasca, Head of Urbanite, Frost* Collective, who showcased the studio’s designs for Goodman and Macquarie Bank’s offices at 1 Martin Place, where the environmental graphics integrate seamlessly with the architecture. The building is raw and unfinished, so “we wanted to make our graphics feel like part of the building fabric,” explained Carlo. Even the pictograms are playful and thoughtfully adapted to suit the environment. It was especially interesting to learn about each studio’s design process, and the journey designers take their clients on from brief to execution. Tactics include kicking off with a workshop to gauge people’s response to different types of imagery and graphics, and asking stakeholders to mutually agree on the brief before embarking on further strategy or design work. Since its launch in 2017, SEGD’s Sydney Chapter has quickly evolved to become a close-knit, fast-growing community of experiential designers. Thanks to Wizardry Imaging & Signs for generously sponsoring last night’s event – it was a huge success, and we’re already looking forward to the next one. 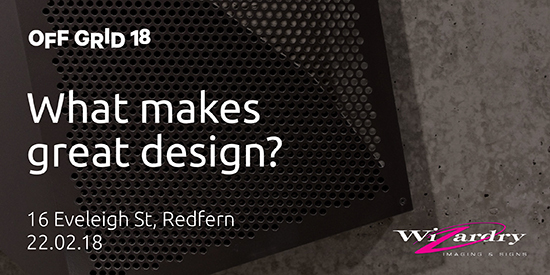 What makes a great design - new speaker! SEGD Sydney Chapter is excited to announce the addition of a third speaker to our roster for ‘What Makes Great Design’. Susan Mavor, Principal Communication Design and founding partner of Vancouver-based studio PUBLIC will be stopping by Sydney on her way to this year’s Off Grid 18 in Wellington. Susan has valiantly agreed to battle jet-lag and join us on the evening to speak about her work on the University of British Columbia Donor Recognition, a project that was deservedly recognised with a 2017 SEGD Global Award. Susan’s work ranges in scale from postage stamps to billboards and in ambition from recognition of a donation to shaping the way we understand culture, memory and identity. Her insights into work and processes on the opposite side of the Pacific will provide an intriguing counterpoint to Carlo Giannasca (Urbanite) and Charlie Bromley (THERE) as they explore their own amazing local projects and practices. Susan will join the Q & A session following the talk. We’re looking forward to seeing you next week for this great event, generously sponsored by Wizardry Imaging & Signs. SEGD Sydney Chapter is thrilled to announce our first event for 2018. Two of Australia’s leading Experiential Graphic Design agencies, Urbanite and THERE, have agreed to share the stage and talk us through their recent SEGD award-winning projects. Urbanite was recognised for their work at 1 Martin Place and Goodman Property, while THERE excited the jury with their placemaking for Knight Frank and Rabobank. Carlo Giannasca (Head of Urbanite, Frost* Collective) and Charlie Bromley (Head of Environments, THERE) will share insights into just how these projects came about, what was the brief, what were the inspirations and challenges, what went right, what went wrong, and what it takes to consistently deliver quality design outcomes. We’re also pleased to announce Susan Mavor (Founding Principal, PUBLIC) in Vancouver, will be joining us on stage. She will be exploring their own award-winning work on the UBC Donor Recognition project, and providing an international perspective to the evening. A Q&A will follow the talk where attendees can gain an insight into how these companies work and manage their design outcomes. This talk is a must for anyone interested in the design process and the reality of delivering internationally recognised design. This event is being held in conjunction with Off Grid 18: The Experiential City. Off Grid is a different kind of design conference that encompasses Melbourne, Sydney, Brisbane, and concludes in Wellington on the 26-27th of February. We are looking forward to welcoming some truly exciting international visitors who might even share some of their thoughts on the night. We’re also thrilled to announce this event is sponsored by Wizardry Imaging & Signs. Where: 16 Eveleigh St, Redfern. When: Thursday, 22nd February at 7pm. Ticketing: This is a free event. 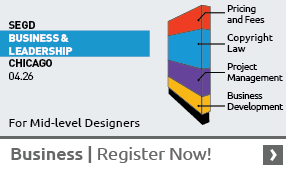 SEGD members are guaranteed access, but it’s a small venue so visitors are on a first-booked-first-served basis. The panellists were: Bryce Hutchinson, UTS; Nick Bannikoff, BrandCulture; Bruce Duyshart, Meld Strategies; Steve Plummer, Pam Wayfinding; Nigel O’Connell, Displayground; moderated by Stephen Minning, BrandCulture and Pam Wayfinding. SM: Bryce, tell us about the UTS $1+ billion master plan in terms of your wayfinding objectives? BH: In 2013, Frost*Collective completed a signage manual, and then BrandCulture won the tender as head consultant for wayfinding implementation. This was a unique opportunity for UTS. Existing signage was over 10 years old so we wanted a new wayfinding system that would represent industry best practice, and match the university’s strategic vision. Unfortunately, the scope of work was not simple. There were four new buildings, 14 existing buildings, and major refurbishments. You can understand how difficult it was keeping design documentation up-to-date with so much changing. SM: Why key issues did you identify? BH: The biggest issue was signage clutter. We did lots of student testing, and the main complaint was that there was too much signage, and it was overwhelming. We had a lot of redundant signage – universities are big organisations, and when someone changes their name, for instance, that name might appear on 20 signs across campus. We had no way of tracking this easily. Asset management and naming conventions quickly became important to us. We needed a much better solution for quality control, defects inspections, tracking costs and invoices. BrandCulture developed a fantastic interface for this. SM: Nick, tell us how BrandCulture approached the signage implementation? NB: We had over 110 floor plans to audit, and 46 new floor plans to design. It was a hugely complex project that required some smart solutions so that, at the very least, we could keep our sanity! 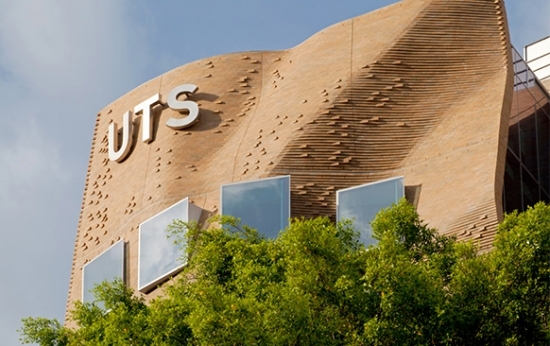 UTS is a technology-focussed university, and finding smart solutions is part of their brand and cultural DNA. The solution that sprang to mind was a digital one. We decided to create a proprietary system that was bespoke to UTS, which we could outsource to suppliers and stakeholders – a cloud-based platform for cross-referencing photos, notes and sign details, which is now called PAM Wayfinding. SM: Is all the information relating to physical, digital and mobile wayfinding connected somewhere? NB: Yes, by doing everything through PAM, it means UTS has a single source of truth for their databases to come together in. SM: Bruce, can you take us through your digital wayfinding vision? BD: The challenge for us was to make the campus smarter for lecturers and students getting to class. We did some in-depth user group interviews with everyone from international students, to campus security, to develop a clear picture of how technology might work for them. We realised we needed to address the issue of accessibility – in 2014, there were 1,200 UTS students who identified as having a broad spectrum of disabilities, and our research showed the iPhone as the option that worked for everyone. This helped us establish an information architecture concept: we wanted signs to be able to interact with people’s smart phones to support people from one location to the next. SM: UTS has 65 different sign types. How did you work out which sign types could integrate technology most effectively? BD: We created options to cover all bases, which meant introducing QR codes, NFC chips, beacons, WAP, Wi-Fi access points and security cameras, which made physical signage and totems much smarter. The next challenge was bringing the information in PAM through to people’s iPhones. PAM developed a microsite, which you can access with QR codes or NFC chips, without downloading an app. BH: It’s worth noting the initial scope was for physical signage only, but Stephen got an idea and ran with it and really pushed for technology-focused signage, which we saw the value of. SM: Steve, can you tell us about PAM’s role in implementing smart technology across campus? SP: We went through a series of trials to find out if our solution was meeting people’s needs. By putting wayfinding in people’s pockets on their phones, we could share the 5,000 pieces of information we had stored in PAM about where people and places are located at UTS. 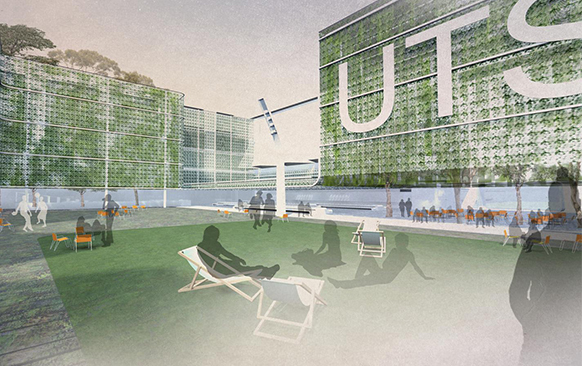 PAM was developed in collaboration with UTS and its project stakeholders. It sits in the middle and brings all the mapping, audit images, floor plans and notes together, creating a single source of truth for building management and the FM database. By bringing the physical and digital together, it creates a live wayfinding CMS for the whole university. SM: Nigel, you’ve been working with UTS also. Can you take us through your involvement? NO: A few years ago, UTS approached Displayground to install some new displays. Stephen showed me examples of generative data visualisation, like the work of Refik Anadol in San Francisco, which takes data and turns it into art. For UTS, we wanted to take their new branding, which they’ve based around big data, and have a play with it to see what we could achieve. 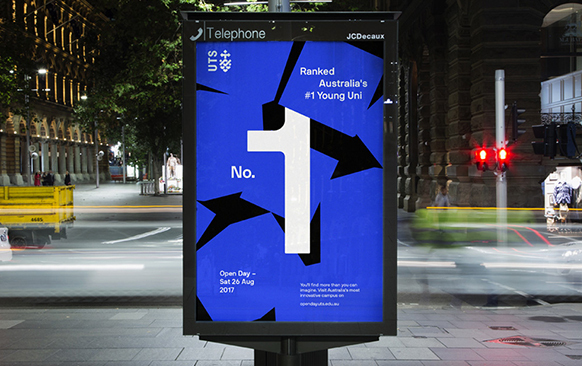 The idea is to create interactive displays that use big data to connect into the UTS brand. ‘Navigating the Smart Campus’ is an SEGD Sydney Chapter event, which took place on 15th November at WeWork, Martin Place. The State of UX Design in Australia? Nick Bannikoff and Carlo Giannasca recently spoke to InDesign about why they’re on a mission to build a strong community of experiential designers in Australia. 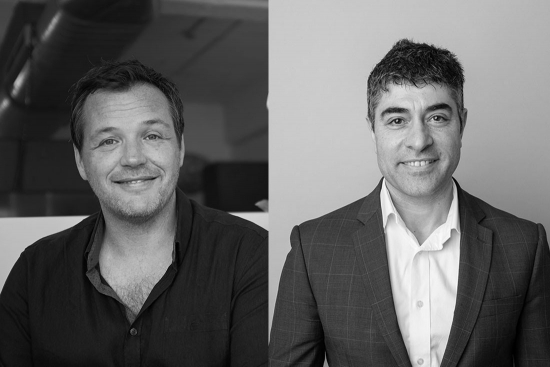 Earlier this year, Nick Bannikoff (BrandCulture) and Carlo Giannasca (Urbanite) announced they were bringing the Society of Experiential Graphic Design (SEGD) to Sydney. They spoke to InDesign candidly about the rise of experiential design (UX) and how the blending of graphics, wayfinding and interiors can make for better-branded workplace/retail fitouts. Nick Bannikoff: Many people still think ‘experiential design’ means logos on walls. How do you define what we do? Carlo Giannasca: From our perspective, experiential design is about adding elements to a space that create moments of surprise or joy – it’s often an intangible, indefinable X factor. I don’t think you can underplay the value of what we do as creatives who enhance people’s wellbeing through environmental and wayfinding design. If you’re designing a space that’s pleasant to be in, people are happier to come to work – and that elevates the company’s brand. NB: The experiential design community is probably larger than we think it is here in Australia. We have interior, graphic, wayfinding and experiential designers, architects and fabricators, but we’ve also got exhibition, event and set designers – we could all benefit from collaborating more. CG: Definitely. Australian designers have an amazing pedigree in creating experiential design pieces. We should celebrate that. If we’re engaged at the same time as architects and interior designers, we can create really amazing, embedded brand expressions where you really can’t tell where the interior design or architecture ends, and the branded graphic expressions start. The whole thing feels like one complete creative piece. For me, that’s the ideal. NB: A big part of our role is explaining to clients that the connection to brand can be very subtle – no one wants to see a logo blinking at them every day of the week. Some brand custodians are still very protective. They might not realise that the brand designer was more focussed on print and digital media than how it might be applied in the built environment. Yet the most successful workplace schemes we’ve developed are those where the branding is embedded into the interior architecture and isn’t too overt. CG: It’s always a collaboration. We’re not trying to fight against what architects create, we want to enhance their work. We usually kick off a project by asking the client to express how they see their brand. Typical questions are: ‘Someone walks into your office or space. What do you want them to think about your organisation? How do you want them to feel when they walk into a space?’ Getting them to articulate those emotional and rational responses helps them think from an end user perspective, rather than being very dictatorial about their brand. NB: I think the connection between wayfinding and wellbeing is also really interesting. If you’re in an airport or hospital and you have trouble finding where you want to go, that’s a really stressful predicament. CG: Wayfinding empowers the end user by giving them the tools they need to get from A to B in the quickest, least stressful way possible. No one likes to get lost, unless you’re on holiday wandering the back lanes of some European city. NB: I don’t mind getting lost on holidays. I’ll walk out the front door of a hotel or train station, and think, ‘That looks interesting – let’s go’. When I’m designing wayfinding systems for a large environment like a university or campus, I often start off with that approach – I just walk around for a couple of hours and see where it leads me. Getting lost can be a very good design tool. CG: One trend I’m noticing is a much stronger emphasis on designing with the end user in mind. I am seeing requirements emerge that mandate the need to demonstrate a methodology for testing design work – interviews, surveys and lo-fi prototyping are inevitably going to become an important part of the formal design process. Then if it’s not working, fine-tune it. NB: I agree – our government clients have really started to pick up on the importance of having an evaluation process. It’s about saying: ‘Okay, we’ve made these assumptions. Now let’s actually talk to people afterwards and find out what the truth of the matter is.’ Most of the time we get it right, thankfully! CG: When I judged the SEGD Awards in Washington this year, I was struck by the strength of the community of experiential designers there. There’s no sense that everyone is protecting their patch, or trying not to give away trade secrets. There’s a willingness to share ideas – which lifts the whole game I think. NB: In my experience, whenever you get people in our industry together they’re excited to speak with somebody who actually understands the intricacies of signage plans and arrow types and layout grids. There is a real enthusiasm to connect and discuss. CG: There’s also an opportunity to really elevate our profession, because experiential design is very important to the outcome of built projects. What we do is just as valid as what an architect or interior designer does – we are part of the puzzle that brings successful urban projects into being. That should be celebrated.